It is really intriguing why we often fail to accept responsibilities in life. People hardly want to accept responsibilities for the failings and misadventures in their lives. We blame our Parents, Spouses, Children, Friends, Bosses, Colleagues, Employees, Enemies, our pets, and every other thing but ourselves. The truth is nobody can hinder you from doing what you want, if your mind is really focused on it. And whatever reasons we may give for our failures are simply excuses, whether we want to admit it or not. Folks no one else makes you fail, you have only have yourself to blame. True achievers, all truly great people know this truth. They accept responsibilities over their lives, only losers blame others. 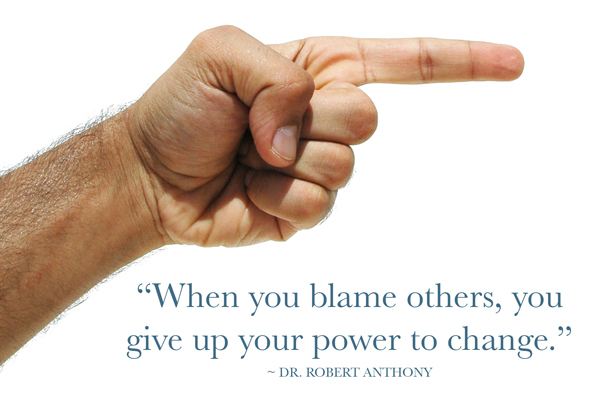 If you find yourself always blaming others for most of the results in your life, why don’t you try examining your actions or inactions in the events that produced the results, you may discover like I have done too many times, that you are responsible for everything that happens in your life. Truly my pleasure! I liked it & felt others would, too…it hits us where we live! I love that quote myself. And true the ability to always look back at our actions or inactions, for me, is very important. No matter the roles others may play, I always like to look at what I did, because, that’s the only thing I can control or change. I can’t change or control Others’ actions. Thanks Marie!…I sent the mail, hope you received it? Such a great post and poem too! These days there seems to be more and more blameshifting and less and less of taking responsibility for the difficulties and the simple things in a person’s life. Very sad! Why do you think so Eric?